We are excited to offer special guided tours for schools and youth groups such as cadet corps, scouts and other organized groups. The minimum group size for these tours is 10 and we can easily accommodate a bus-load at a time. We offer school tours year round for groups of at least 10. You can book now for tours throughout 2017. Call us for details: 1-519-633-7641. School and youth group tours must be booked in advance by calling the Museum at. Our staff will be happy to arrange your tours and provide you with all the information that you will need to ensure an enjoyable and educational visit. Preliminary numbers can be booked at any time. However, final numbers must be confirmed at least 48 hours in advance of the tour. We offer several payment options for your convenience. * Advance payment is preferred and can be made by VISA, MasterCard or school cheque. Alternatively, with approval, the Museum will invoice the institution on receipt of an official purchase order. Payment can also be made on site by credit card, cash or approved pre-approved institution cheque. Minimum charges will be based on the numbers confirmed at least 48 hours in advance of the tour. * These options are under review and the Museum reserves the right to modify them without notice. Inside Tours: Because some of the submarine compartments are small, each tour group in limited to 10 people plus the guide although this number can be increased by one under limited circumstances. Contact the Museum for more information. Up to 5 groups can tour the boat at the same time. Each inside tour takes an hour plus a 12 minute question and answer period at the end. Talk to our representatives about the advantages and availability of consecutive versus shot gun starts. Outside tours: Fish Eye Tours of the outside of the submarine are divided into groups of 20 to 25 people and take an average of 45 minutes. Three tours can be run simultaneously. Adult to youth ratio: For youth over the age of 12, there must be at least one teacher/adult leader for every 9 students/youths. For students between the ages of 6 and 12, there must be at least two teachers/adult leaders for every 8 students/youth. If your school or group required a higher teacher/student ratio, please make sure that you meet your institution's requirements. 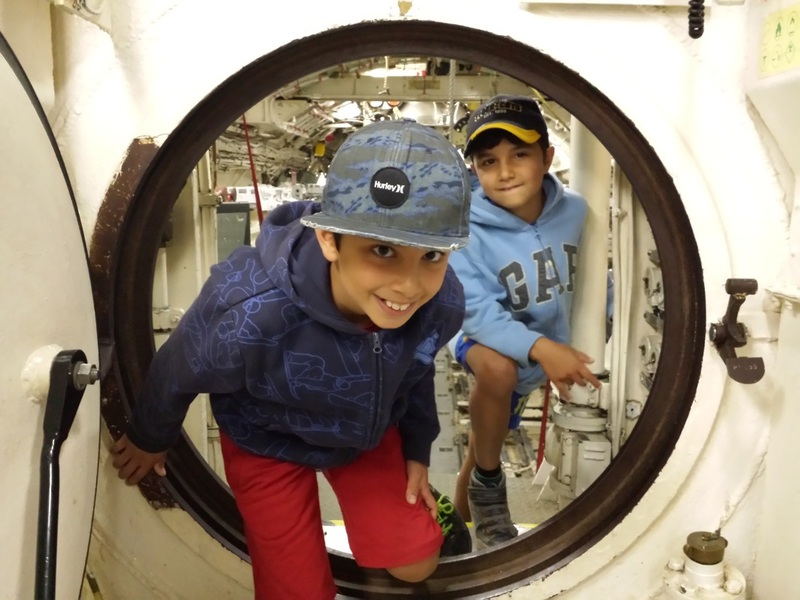 Note: the inside tour of the submarine is not appropriate for children under age 6. These are all-inclusive prices and cover both the inside and exterior tours of the submarine. 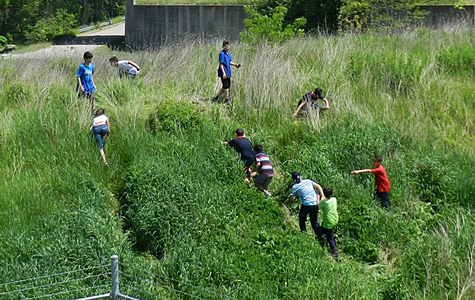 * A fixed price of $16.50 applies to all school/youth groups taking the Land, Sea and Air Tour option. There is plenty of free parking for your buses/coaches. Once the students have been dropped off at the entrance to the facility, the buses can be parked in the south side of the parking lot. At the end of your tour, buses can return to the entrance area for easy boarding. Over the past few years, we have developed a unique package of options to enhance the experience for those who are looking for longer programs. Falling roughly under the categories of Land, Sea and Air, we offer a Land & Sea component and, when our partner at the Canadian Harvard Association is available, an Air component. Currently, in addition to touring the submarine, students learn to execute some of the evasion tactics developed by the convoy system during the Battle of the Atlantic and then they divide into groups and re-enact the Canadians landing at 'Dieppe' in August 1942. An additional option includes a stop at the Elgin Military Museum in St. Thomas. Some groups choose to have a lunch module with a picnic on site while others have opted to book lunch in the village just a few minutes walk up the hill from the submarine. 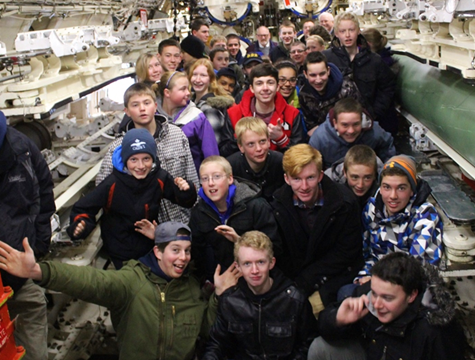 Ask us for other options should you wish to see both HMCS Ojibwa and the Military Museum. Canadian 'soldiers' attempting a landing during the Raid on Dieppe. Teachers are encouraged to ensure that all students are aware that in the late fall and early spring, they will require a warm coat while they are in the submarine. Gloves/mitts are also desirable as the programs are all both inside and outside. Also, those cool shoes are at risk of getting soaked or muddy in wet weather. We want everyone to be warm, dry and comfortable during their visit and on the way home! Tip: we find the one time use hand warmers that can be inserted into pockets or gloves to be a great addition to the trip kit.